An operation by the 1st Commando Brigade to cross the River Rhine and capture and hold Wesel. The above photo © IWM (BU 7670) shows the devastation after the air raid. The following account was written by Harry Fecitt MBE, TD, ex-17 Para. Operation Widgeon utilised 1st Commando Brigade in a crossing of the River Rhine opposite Wesel, twelve hours before the American 17th Airborne and the British 6th Airborne Divisions landed on higher ground to the north of the town. Wesel had to be captured as it was a German communications centre and a strong point that unless seized could jeopardize the British 2nd Army and American 9th Army crossings of the Rhine on either side of the town. 1st Commando Brigade was not the first Allied formation to cross the Rhine as General George S. Patton had just pushed an American division across many kilometres upstream, and the British 51st (Highland) Division crossed an hour ahead of the Commandos further downstream. Widgeon was a success, primarily because of the prior detailed planning and intensive training performed by the Commandos and the aggressive tactics used by them as soon as the river was crossed. As can be seen by the citations for the eight gallantry awards made to Commandos, leaders at all levels anticipated contact with the enemy and dominated the battlefield before many German soldiers knew what was happening. Without any doubt the one factor that assisted the Commando Brigade in quickly seizing key features in Wesel was the prior bombing by the Royal Air Force that reduced most of the city to rubble. During the fighting many hundreds of German troops were killed or captured, but the Commando Brigade suffered less than 100 casualties. The Brigade completed its mission satisfactorily, linked up with the 17th Airborne Division to the north, and was supported itself by a battalion of the Cheshire Regiment that crossed the river on the 24th March. By the evening of 25th March all of Wesel was in British hands and Field Marshall Bernard Montgomery’s Allied 21st Army Group was pouring across the Rhine on its mission to isolate the Ruhr area where the majority of Germany’s critical war industries were located. In a message to Air Marshall Arthur Harris, Commander in Chief of Bomber Command, Montgomery wrote "My grateful appreciation for the quite magnificent co-operation you have given us in the battle of the Rhine. The bombing of Wesel last night was a masterpiece and was a decisive factor in making possible our entry into that town before midnight." 1st Commando Brigade - formerly 1st Special Service Brigade. In March 1945 1st Commando Brigade was commanded by Brigadier Derek Mills-Roberts. No. 3 (Army) Commando - Commanding Officer Lieutenant Colonel P.I. Bartholomew. No. 6 (Army) Commando - Commanding Officer Lieutenant Colonel A.D. Lewis. 45 (Royal Marine) Commando - Commanding Officer Lieutenant Colonel W.N. Gray. 46 (Royal Marine) Commando - Commanding Officer Lieutenant Colonel T. M. Gray. After being withdrawn from Normandy to England in September 1944 the Brigade had been deployed into the Netherlands in January 1945 and it had been fighting its way eastwards since then. All ranks were well trained, experienced and confident. The German opposition that could expect to face east of the Rhine consisted of high level parachute troops and lower level formations of more elderly men. The Brigade was supported by the 84th Field Company, Royal Engineers, commanded by Major J.J.D. Groves. This Field Company provided the wooden assault boats named storm boats that carried 5 or 6 fully equipped soldiers and two crew. 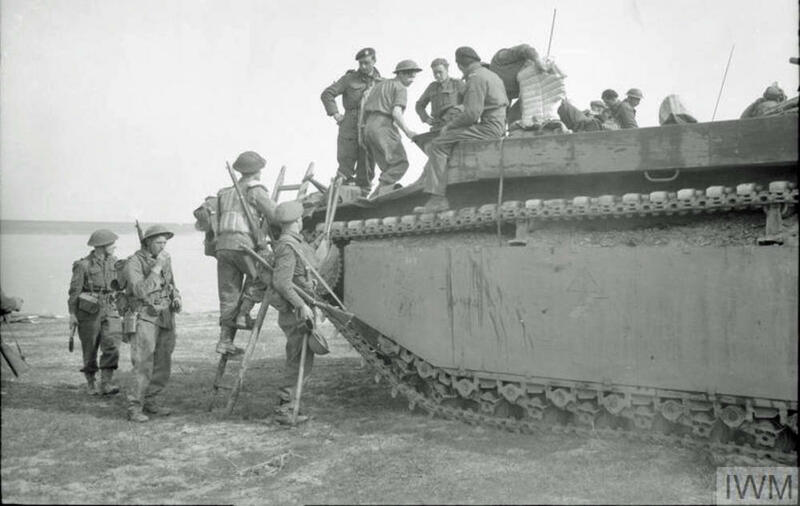 As Buffaloes were also to be used (tracked landing vehicles that could carry up to 18 fully equipped men) the Field Company constructed the launching sites on the south bank of the Rhine, and later cleared the mines from the landing site on the north bank. 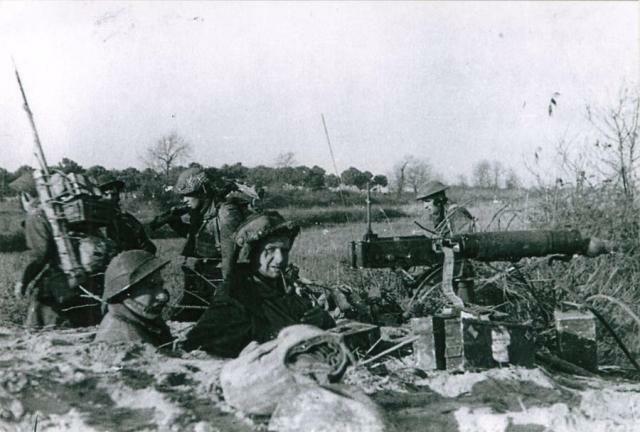 Forward observation parties from 1st Mountain Regiment, Royal Artillery, were attached to the Brigade to provide direct fire support on the north bank. The Brigade had to be across the river before the final RAF bombing raid was delivered so that the massive bombardment could be rapidly followed up. To achieve surprise an unlikely part of the river was to be selected for the crossing. The Brigade was not to attempt to secure the whole of Wesel but was to concentrate its defence on the northern edge, based if possible around a large factory. To leave the Germans guessing about what was happening no trace of the Brigade was to be left at the crossing point and all ranks were to quickly enter the town carrying their own supplies. To ensure the mobility of the Commandos anti-tank guns were not to be taken and it was assumed that the effects of the bombing would block enemy armoured fighting vehicle routes into Wesel; perhaps rather optimistically it was hoped that German hand-held anti-tank weapons could be quickly captured in Wesel and then used by the Brigade. On 6th March the Brigade concentrated at Venray, where a creek ran into the River Maas, for two weeks of intensive training in river crossing. The Brigade was then ready to deploy. The selected crossing point was about 4,000 metres west of Wesel where a muddy flat piece of land named Grav Insel formed the northern bank. Here the river was around 300 metres wide and it travelled at 5 knots (10 kilometres per hour) in an east to west direction. The first troops over the river were swimmers from No. 5 Combined Operations Assault Pilotage Party who successfully reconnoitred the north bank in bright moonlight on the night of 23/24 March. Twenty four hours later, following a raid by 77 Lancaster bombers at 1730 hours which was the prelude for a large artillery concentration fired by the British Army, Commando Brigade Tactical Headquarters and No. 46 (Royal Marine) Commando crossed the Rhine in Buffaloes at 2130 hours. Some unit rum issues had not been rationed that evening. The routes to the crossing points were marked on the south side by tape and lights. The landing vehicles took four minutes to cross and then returned to load up the next waves. Captain John Douglas Gibbon, Border Regiment attached to No 46 (Royal Marine) Commando, leapt ashore and the citation for his Military Cross describes the energy and determination that he displayed. John Gibbon’s Forward Observation Officer and signallers were in the burning LVT and so he had no means of controlling the friendly artillery fire falling around him. Meanwhile, on the river bank, Lieutenant A.J. Allen, 46RM Commando, and three men scrambled out of the burning Buffalo and, despite suffering burn wounds, Allen led his troop forward. Captain B.W. Pierce, 46RM Commando, immediately attacked the enemy trenches lining the river, and as they had just been subject to ten minutes of heavy shelling by British artillery the 65 German occupants were in a dazed condition and rapidly surrendered. The Commanding Officer of 46RM Commando, Lieutenant Colonel Thomas Malcolm Gray, had led and inspired his men well, this being recognised with the award of the Distinguished Service Order. One of Colonel Gray’s Marines, PO/X 108682, Marine James Henry Hazell, 46RM Commando, reacted swiftly to the danger from friendly artillery fire once he was on the north bank of the river, and was awarded a Military Medal in recognition of his gallantry. During the establishment of the initial bridgehead over the Rhine near Wesel on 23rd March 1945 a section had advanced too quickly and was in danger from our own artillery barrage. Marine Hazell was ordered to bring them back. He ran forward, and at that moment the barrage, fired by six Field Regiments, came down in the vicinity. Shewing complete disregard for his own safety he dashed forward and ordered the section to withdraw. When on his return it was discovered that two men from the section were missing, Marine Hazell acting on his own initiative immediately went forward again without orders, and in spite of the barrage, which was still falling, brought back the two men. The cool initiative and high courage shewn by this Marine was a magnificent example to his comrades. As the Buffaloes reorganised and reloaded on the south bank of the river 6 Commando crossed in storm boats that had been launched in a lagoon two thousand metres west of the crossing place. Many outboard motors failed and enemy machine gunners and riflemen targeted the boats as the motors were adjusted. One boat drove itself straight underwater, drowning Lieutenant J.F. Hume-Spry, Royal Artillery and No. 6 Commando, and some of his men. Regimental Sergeant Major W. Woodcock had three boats shot from under him before he crossed. Fortunately dorys (light rescue boats) were deployed on the river and most men from sinking storm boats were recovered. Despite the difficult conditions 6 Commando crossed the river and prepared for its next task which was to guide the Brigade into Wesel. As the Buffaloes shuttled 45RM Commando and No 3 Commando across the river the RAF delivered its final bombardment onto Wesel. 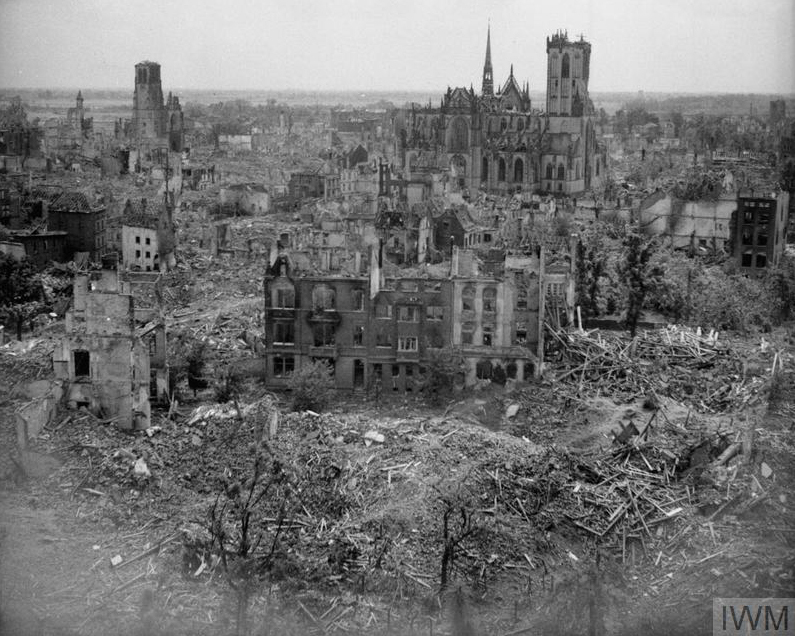 The Army request was for 300 tons of bombs but the RAF increased this to 1,100 tons and Wesel with its military garrison and its civilian population of around 24,000 persons was heavily damaged. As soon as the last RAF bomb had fallen 6 Commando led the way eastwards into Wesel, running out and trailing a white marker tape as it moved. The Brigade followed in file, the wounded and the prisoners from the contacts at the landing place having been evacuated across the river. Major C.E.J. Leaphard led the vanguard company and was faced with a strongly defended flak (anti-aircraft gun) position which he immediately assaulted, killing or capturing all its personnel. Further enemy locations blocked the route but were quickly dealt with. The advance continued rapidly into the shattered city which resembled a moonscape and 6 Commando occupied a perimeter whilst the remaining units passed through it. In recognition of 6 Commando’s performance the commanding officer, Lieutenant Colonel Anthony David Lewis, was awarded the Distinguished Service Order . Lieutenant Colonel Lewis was in command of No. 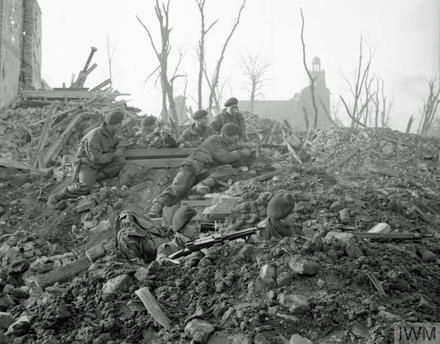 6 Commando on 23rd March 1945 when this unit led the First Commando Brigade from the banks of the Rhine into the City of Wesel. Speed was the vital factor in this operation, as it was necessary to enter the city as soon as possible after the bombing. This was achieved largely by the skill and daring displayed by Lieutenant Colonel Lewis who led his troops with such dash that three separate platoon localities were quickly over-run on his way to the city. His entry into the city itself in spite of considerable opposition from small arms and panzerfausts was effected so quickly that the remainder of the brigade was enabled to consolidate before the enemy became aware of the situation. Lieutenant Colonel Lewis was at all times at the head of his troops, and his trust and courage contributed largely to the success of the whole operation. 45RM Commando took over the lead and led the Brigade to the northern edge of the city. Navigation was not easy because of the rubble from wrecked buildings that often filled the streets. Despite the heavy bombing many partially dazed German defenders bravely fought back. The Brigade was not large enough to control all the city so a defensive strip was located in the northern and north-western suburbs with the aim of preventing enemy movement in or out of Wesel. 45 Commando occupied a large wire factory and the other Commandos came into line on the left (west) in the order 46, 3 and 6. Defensive positions were prepared and improved after first light when contacts with enemy troops moving both north out of the city and south into it began. Enemy counter attacks were mounted from the north but all were repulsed despite the absence of anti-tank guns. Ammunition expenditure was strictly controlled because of the lack of a resupply system during the first 24 hours; this was deliberate as part of the Brigade plan was to deceive the enemy as to the strength and exact location of the Brigade and a supply chain would have been vulnerable. Lieutenant Colonel William Nichol Gray DSO was awarded a Bar to his Distinguished Service Order in recognition of his decisive leadership whilst hampered by a wound. Lieutenant Colonel Gray commanded No. 45 (Royal Marine) Commando during the assault across the Rhine and the capture of Wesel on the night 23rd-24th March 1945. Lieutenant Colonel Gray’s task was to force his way to the Northern sector of the town and seize a factory which was vital in order to achieve a successful consolidation. Following up rapidly behind the leading unit who had broken into the city, he passed through and debouched into the streets. While leading his troops at speed and clearing all opposition in his path with great determination he was wounded by a panzerfaust fired at close range. In spite of his wound he refused to be evacuated and completed his important task. Having captured the factory he disposed his troops so skilfully that during the next thirty six hours they were able to beat off three major counter attacks by infantry and self-propelled guns with enormous casualties to the enemy. Throughout this time although he was suffering considerably from the pain of his wound he was constantly encouraging his men, who were inspired by their Commander’s example. Not until the last counter attack had been broken, forty eight hours after he had been wounded did this gallant officer allow himself to be evacuated. During the fighting on the west of the Brigade position 6398404 Sergeant Frederick Worthington, Royal Sussex Regiment and No. 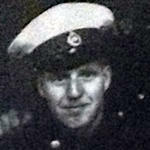 6 Commando, reacted quickly to observed enemy movement as outlined in the citation for the award of his Military Medal. At Wesel on the 24th March 1945 Sergeant Worthington was in charge of a small defensive position on the outskirts of the city when he saw an enemy bicycle patrol coming towards him at a range of about 1,000 yards. The patrol suddenly turned off down a side street and disappeared from view. Realising that they were heading for a part of the town which had not yet been consolidated, Sergeant Worthington acted immediately and sent a runner to tell his Troop Commander of his action. He then left a skeleton force in the defensive position and taking the remaining eight of his men he set off to ambush the patrol. He struck the side road just in time to meet the patrol head-on and fired on them from houses by the side of the road. Eight of the enemy were killed or wounded, five taken prisoner and the remainder fled. Sergeant Worthington himself was wounded at the start but refused to hand over or even have his wound dressed until the action was over and the patrol brought back. By this successful action and by his own initiative, gallantry and immediate action Sergeant Worthington liquidated the enemy patrol and prevented them from running into another unit who were just then at that awkward stage prior to consolidation. Elsewhere a patrol led by RSM Woodcock of 6 Commando came across the headquarters of the Wesel garrison commander, General Deutsche. This German headquarters was only 100 metres from where the Commando Brigade HQ had sited itself. The General refused to surrender and was shot dead. A very useful map showing all anti-aircraft gun locations around Wesel was recovered from the garrison headquarters, and the details were passed back to enable Allied air strikes to be mounted. At around 1000 hours on 24th March the British 6th Airborne and the US 17th Airborne Divisions dropped on zones a few kilometres north of Wesel. Many lessons from the failure at Arnhem had been absorbed into the airborne plan, especially the need to descend right on top of the tactical objectives. German flak had not been suppressed sufficiently by Allied airstrikes or artillery and there was consequent carnage particularly amongst the plywood gliders of the British Airlanding Brigade and the US Glider Regiment, and amongst the US carrier planes who few straight and low over their parachute dropping zones as did the re-supply bombers that followed. One reason for the unexpected appearance of these German flak weapons was that many of the 20mm guns were mounted on vehicles and they could quickly occupy alternative positions when they felt threatened by Allied planes or guns. Despite the quick reduction in available strength due to casualties the drops were successful and all objectives were seized. The principle of overwhelming force saw over 17,000 Allied airborne troops delivered in one lift. The personnel drop was quickly followed by a large supply drop delivered by 240 B-24 bombers; the recovery rate for these supplies was 80% in the 6th Airborne Division’s area. Allied airborne casualties were around 2,600 killed, wounded and missing which was in fact less than had been forecast; 4,000 German troops were taken prisoner and many others were killed. The enemy on the ground, apart from some parachute and SS troops, was generally demoralised by the swiftness and size of the drop and was keen to surrender once the battle started. 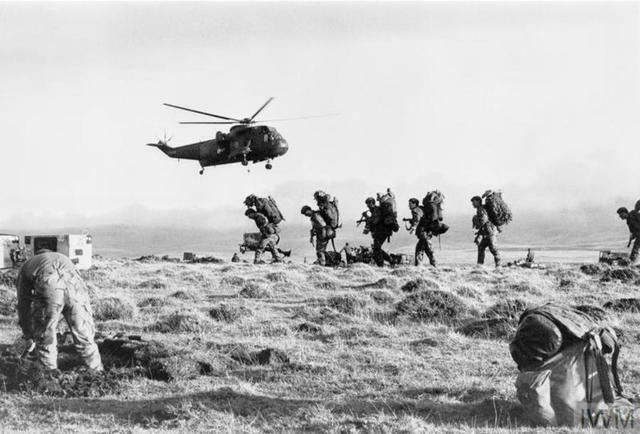 However there was one serious impact on the Commando Brigade’s operation and that was a cessation of supporting artillery fire during the airborne personnel and supply drops. An example of how this lack of artillery support affected fighting during the German counter attacks from the north can be gleaned from the citation for a Military Medal awarded to No. PO/X 106961 Lance Corporal John Sykes, 45RM Commando. On 24th March B Troop 45 RM Commando were in position at the north-eastern end of the Wesel wire factory. During the period of airborne landing no artillery was available to the unit for three and a half hours. Two 88-mm self-propelled guns approached to approximately 500 yards and engaged the troop position. Lance Corporal Sykes was in charge of the forward Bren Group sighted outside the north-east corner of the building. A shell burst four feet above his position on the wall, seriously wounding his No. 2 of the Bren. He immediately assisted the Medical Orderly to remove the casualty and organised a relief and then engaged an enemy machine-gun position 250 yards (to) his right front. Five minutes later another shell burst immediately in front of his trench blowing his Bren gun out of the position. Sykes again left his cover and under machine-gun fire recovered the gun, which was still serviceable, returned to his trench, and again engaged the enemy. A third shell hit the wall to the left of his position, this time breaching the barrel of the gun, Sykes jumped from his trench with the damaged gun, ran to Troop HQ for the spare Bren and returned to his post and returned the enemy’s fire. His aggressive spirit and determination to fight back was a shining example of courage during a most trying period and was an inspiration to all ranks. On 24th March the 1st Battalion the Cheshire Regiment crossed the Rhine in support of the Commando Brigade and this reinforcement allowed fighting patrols to start clearing Wesel of the enemy. Resupply arrived and casualties were evacuated. After last light a Commando patrol made contact with the US 17th Division to the north. One report states that an officer leading a US airborne patrol towards the Commando Brigade was shot before identities had been established. On the following day a brave and strong Royal Signals officer in the Commando Brigade Signal Troop, Lieutenant Thomas John Christie, earned a Military Cross for establishing line communications across the river. Lieutenant Christie is the lines officer in the 1st Commando Brigade Signal Troop. He was in charge of the line party detailed to produce line communication across the Rhine after the brigade had made good the bridgehead at Wesel. It was considered vital that this line should be laid at the earliest possible moment. This task was extremely hazardous. All bridges across the Rhine had been demolished and there was considerable shelling and sniping of bridge exits. As soon as a message had been received that the objective had been captured, Lieutenant Christie took a small picked line party down to the demolished railway bridge. 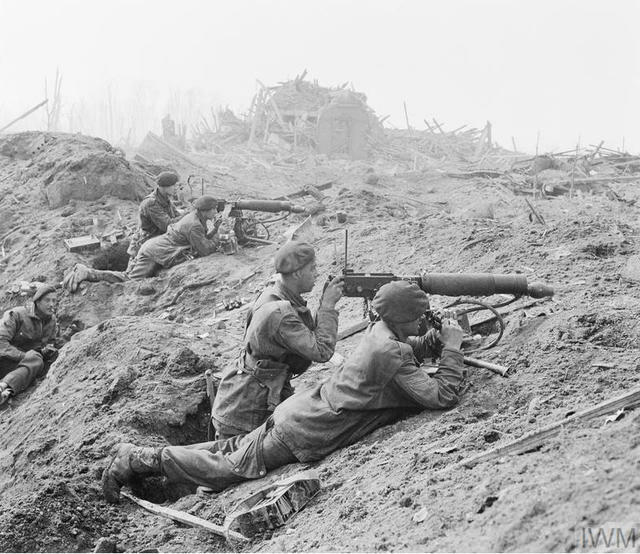 At this point the town of Wesel had not been completely cleared of the enemy and the line party had to work in full view of the enemy machine gun post sited upstream on the east bank of the River. Ordering his small party to pay out the line, Lieutenant Christie commenced climbing across the twisted bridge spans carrying the line with him. At times he had to climb over girders 100 feet above the river while at other times he picked his path along spans which were partly submerged in the water. The pull on the quadruple cable whenever it touched the water was tremendous, nevertheless by sheer courage and determination, Lieutenant Christie crossed the full 1,500-foot length of the demolished bridge under heavy shell fire and spasmodic sniping and machine gun fire, and thus enabled vital communication to be established before the first pontoon bridge had been commenced. This officer’s devotion to duty and complete disregard for his own safety was an inspiration to all who witnessed it. Throughout the campaign he has continuously shown a high standard of efficiency, and his work in line laying during the difficult operations over the Rhine, Weser, Aller and Elbe has, at all times been beyond praise. By the evening of 25th March Wesel was entirely in British hands. A large barrel of excellent hock had been discovered and thirsty throats in the Commando Brigade were lubricated as tales of derring-do on the battlefield were exchanged. The Brigade had taken over 850 prisoners and killed several hundred other German soldiers. The cost to the Brigade had been 2 officers and 9 other ranks killed, 1 officer and 16 other ranks missing, and 6 officers and 62 other ranks wounded. On 3rd April the 1st Commando Brigade advanced again under command of 6th Airborne Division. As Lieutenant Christie’s citation shows, there were more rivers yet to be crossed and more Germans yet to be defeated. Nine other Commandos also crossed the Rhine on the night of 23rd March 1945. They were members of 30 Commando Assault Unit, an intelligence group, who crossed at Frankenthal near Mannheim in the US 6th Army Group sector. They worked with American colleagues on the swift retrieval of important German technical information, and their story is told in Nicholas Rankin’s book Ian Fleming’s Commandos. George A. Brown. Commando Gallantry Awards of World War II. (Private softback Publication 1991). James Ladd. Commandos and Rangers of World War II. (Book Club Associates 1978). Robin Neillands. The Raiders. The Army Commandos 1940-46. (Weidenfeld and Nicholson 1989). Nicholas Rankin. Ian Fleming’s Commandos. The Story of 30 Assault Unit in WW2. (faber and faber paperback 2011). Tim Saunders. Operation Varsity. Rhine Crossing. The British and Canadian Airborne Assault. (Pen & Sword Military softback 2008). Hillary St. George Saunders. The Green Beret. (Michael Joseph 1949).